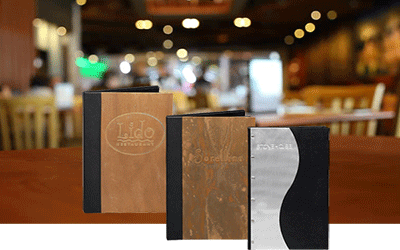 Hand Crafted custom metal menu covers are a work of art. Contemporary, bold and unique in design, no two are exactly the same. These exquisite hand made metal covers are available in one of our Copper or Aluminum finishes. Your Logo is embossed with our process that shows the finest details. Choose from any of our materials to accent the spine. These covers make a bold presentation. Copper covers are available in a wide selection of patina finishes. 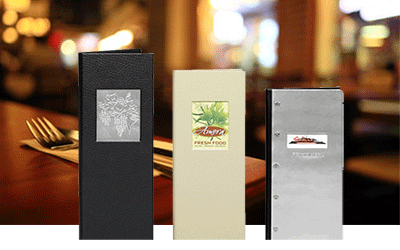 Aluminum menu covers are available in brushed and feathered finishes. 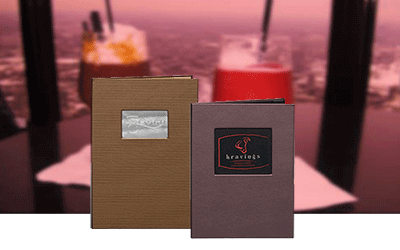 Combined with any of our material lines you have a custom one of a kind menu cover. Custom designed and made. 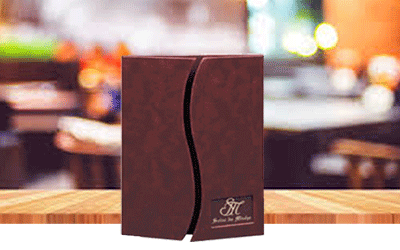 These uniquely styled and handmade menu covers are designed to your specifications. Choose from any of our styles and materials to create your one-of-a-kind custom two-tone menu. If you need assistance with the design we are here to help! Decoration of this line is easy, foil stamped logos, die cut windows with your choice of inserts. Silhouette menus will enhance your presentation. The unique style and shape of the Silhouette menus are designed to your specifications. 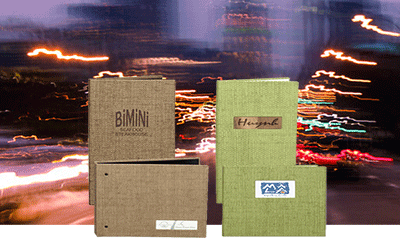 Choose from any of our styles and materials to create your one-of-a-kind custom silhouette menu cover. You can decorate on the metal or the material; these are no limits with this line. Custom shapes are available. When it is all about the intricate logo a window is the answer. Die cut windows are turned edge for a high end finish. 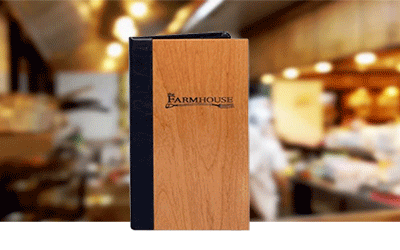 Create a one of a kind menu cover with a custom embossed metal plate; laser etched wooden plate or a laminated photo. There is no limit on what we can put in the window; this style has been made with a hand blown glass insert and also tartan fabric. Looking for an Eco Friendly cover? Our durable basket weave material is a recycled material made in the USA. It has the look and feel of a natural basket weave and brings flair of the tropics to your presentation. 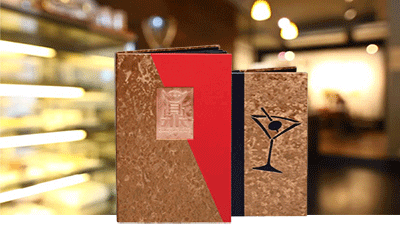 You can choose to decorate your menu cover with a laser etched wooden plate, embossed metal plate or foil stamp. This a perfect choice for the environmental minded. Stylish appearance and handmade, this line is a beautiful alternative to metal. A durable material available in many colors and finishes available to choose from. Easy to decorate with a simple foil stamping or customize with a window. Lined with leatherette or natural linen this line makes an awesome presentation. Wood is one of the newer menu cover additions to our Elite Collection. Starting with genuine wood or a custom stained wood gives you many options. Mahogany, Cherry, Walnut, or Oak is just a few of our offerings. Then choose the material for the spine and back panel. Wood panels are available on both the front and back of the book. We now offer clipboards with an option of colored clips and sizes; we also make boards with rubber bands. The bands are offered in many colors as well to match your design. Laser etching your logo to display the finest details in complex logos full color screening of the board with a detailed image is also available.